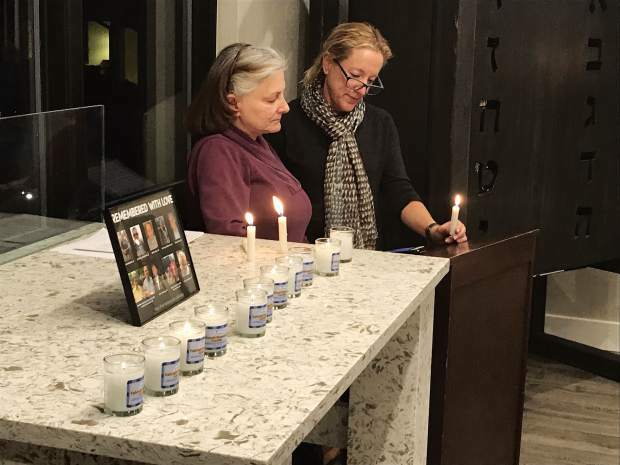 Chabad Vail Jewish Community Center hosted a vigil Tuesday for the 11 murder victims in the Tree of Life Synagogue attack in Pittsburgh. B'nail Vail is inviting the community to its vigil Friday evening in Vail. VAIL — The murderous shots fired in Pittsburgh reached the heart of the Vail Valley’s Jewish community. B’nai Vail is hosting a vigil for the 11 victims of Tree of Life synagogue on Friday, Nov. 2. The Chabad Vail Jewish Community Center held a vigil on Tuesday, Oct. 30. The Pittsburgh attack was the deadliest on a group of Jewish people on American soil in U.S. history. The Jewish community needs your support now more than ever, said Michelle Cohn Levy, with B’nai Vail. “We are inviting the entire community to come together in support of the local and global Jewish communities because of the attack in Pittsburgh. We encourage those who have never been to B’nai Vail to join us,” Cohn Levy said. From 5 to 6 p.m., the congregation hosts an informal coffee/meet and greet at the Vail Interfaith Chapel. An abbreviated Shabbat service follows from 6 to 6:30 p.m. The vigil begins at 6:30 p.m.
Their only request is that you not enter during the service. If you want to come before or after, that’s fine. If you want to come just for the vigil, that’s fine, too. “It’s open to everyone of all faiths. They are welcome and encouraged to attend,” Cohn Levy said. Rabbi Dovid Mintz and the Chabad Vail Jewish Community Center hosted a vigil Tuesday evening. They did not want to wait, Mintz said. “It’s a difficult time, so it’s important for us to come together in unison, to remember with love, and for their memories to be a blessing. We are the hands and feet of those beautiful souls who were taken from us.” Mintz said. They said the prayer Shema Yisoreal for the victims — “the most holy of all prayers, the prayer you say before you depart this physical world,” Mintz said. “They did not have that opportunity,” Mintz said. We must continue to sing that song that they composed through their lives, Mintz said. “Physically, they are not present, but we are the children and grandchildren, and we must continue their work in this world. We are the voice that continues to sing that song. That is why we gathered for this unique memorial and celebration,” Mintz said. For Friday’s service, Chabad Vail lights candles at 5:45 p.m. Shabbat ends at 6:43 p.m. Saturday, Nov. 3. Pittsburgh is known as the city of steel. The Jewish people are incredibly strong, and their destruction has been tried in every corner of the planet, Mintz said. “We are steel and iron,” Mintz said. They’re also like an olive, Mintz said. “The more you crush it, the more oil it produces,” Mintz said. Pittsburgh is also home to more bridges than any city in the world. “Now is the time to build a connection with our brothers and sisters throughout the world. Like the famous sages say, ‘The world is a very narrow bridge.’ The main thing is not to be afraid,” Mintz said. Tragedy shifts the paradigm, and Chabad Vail is taking the security of the Jewish Center seriously. They’ve added video surveillance, key entry and communication with the local police for security during services. It’s a sobering jolt for some to attend services and see Vail Police cars parked outside, Mintz said. “This will be a lesson for all of us, and our resolve will be strengthened,” Mintz said.